As a senior in high school, Jordan was riding home from a lacrosse game, when her coach announced that her husband would be holding a workout class for the lacrosse girls on Saturday if anyone was interested. This vague “class” was none other than CrossFit. When leaving after her first time, after the wall-balls and Burpees, she was hooked. She soon fell in love with the gym and the familiar chalk buckets that lined the floors. Jordan grew up in a gymnastics gym, where discipline and attention to detail were expected. Where pointing your toes was the difference between first and second place in an event. 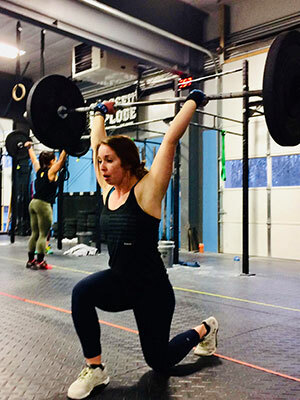 This attention to detail correlated with the skills in the CrossFit gym as technique is imperative for functional movements. Jordan moved to West Chester in fall of 2012 to pursue her degree in Nutrition and Dietetics at West Chester University. She soon became an avid morning workouter, where she brought a smile and energy to the gym that made it feel like it was twelve o’clock in the afternoon. Through her persistence, constant curiosity and attention to detail, she pursued her Level 1 Certification in August 2014 in hopes to help others realize their potential. Today, you’ll find Jordan in the gym at all times of the day ready to welcome you, encourage you, and talk your ear off.